There are 10 days left till our fair, which means we have started the final countdown and continue to pour over our checklists. Despite the fact that we have put on 15 fairs prior to this, each successive one is still a learning curve. But then when you mix in a new venue, the learning curve is much greater. It’s not exactly quite like starting over again, but definitely similarly challenging. However, the most important thing is to stay positive and that’s been easier given the aesthetics of the new site, the amenities readily available, and the concerted effort by all involved to succeed. Moreover, the faculty and students have always been strong supporters of our charity drive, which helps tremendously too. Still having trouble locating our fair venue at The Regent’s School? We recently discovered that part of the problem might be that the many locals still refer to the school by its original name, ‘ISR’, or the International School of the Regents. So now we are also including ‘ISR’, along with ‘The Regent’s School’, when we refer to our fair site. Shuttle buses to the fair will be available on Sukhumvit Highway in front of Father Ray’s Foundation between Sois 36/1 and Soi 36. Look for the dark green wall and the oval red sign for Twinsap Resort, as well as our recognizable, round yellow logos. But then whatever you call it, the best landmark is the Banglamung (Pattaya) Office for Motor Vehicle Registry, which is adjacent to the school. BTW this is the same place that issues Thai driver’s licenses. This year we have an adventurous complex of nets, ropes and wood that will be set up in the shade under the trees on the far side of the oval. 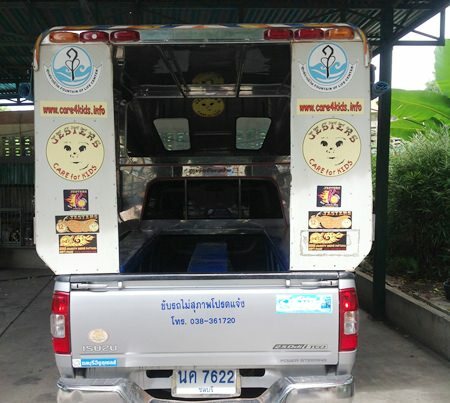 But again if you are not feeling venturesome, please catch one of our shuttle buses north from Central Pattaya on Sukhumvit Highway in front of Father Ray’s Foundation between Sois 36/1 and Soi 36. Look for their dark green wall and the oval red sign for Twinsap Resort, as well as our recognizable, round yellow logos. We always strive to make the fair novel from year to year for the benefit of the fairgoers. We do this by offering different attractions, activities and entertainment whenever we can. 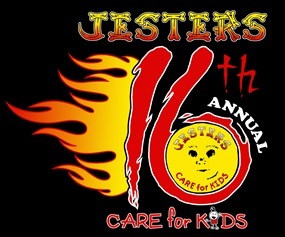 The top prize for the grand raffle at our Gala Party Night is a Honda PCX 150 donated by the Jesters. This year we have an adventurous complex of nets, ropes and wood that will be set up in the shade under the trees on the far side of the oval. 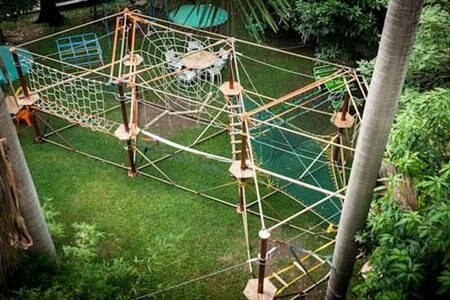 Included in this activity will be climbing exercises through the maze and swinging along the 15-meter zip line. This activity is posted as ‘ideal for kids between the ages of 3 and 10’. 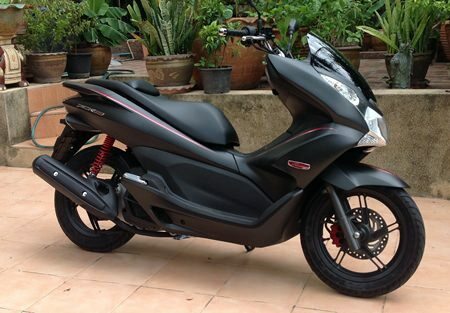 For more info, please see http://www.activecity.asia/mobilesolution. This activity has graciously been sponsored by Uni Gold Shipping Ltd. There will be a stallholders’ meeting at Jameson’s Irish Pub located at the Nova Park Hotel on Soi 4 off Pattaya 2nd Road in Central Pattaya on Monday September 2nd at 7 p.m. Our fair site coordinator will disseminate information about your participation at the fair and the do’s and don’t’ and elaborate. 1. Location: The Regent’s School Pattaya (ISR) on Hwy 36 next to the Banglamung (Pattaya) Motor Vehicle Registry, where Thai driver licenses are also available. 2. Date: Sunday, 8 September from 10 a.m. to 6 p.m.
3. Entrance: Stallholders will have temporary access to the oval area on Saturday, September 7th after the stalls have been set up around 4 p.m. for those wanting to decorate their stall or drop off heavy items and again on Sunday morning, the 8th, between 6 a.m. and 9 a.m. and after 6 p.m. on Sunday. 4. Traffic in the Oval: Will be one way in clockwise direction with parking on the inner side (right hand) so traffic can flow on the outer (left side). Please remember that NO vehicles are allowed on the grass whatsoever. In general, we want to protect the grass as much as possible. 5. Parking: During the event, parking will be available mostly on both sides of the school. Since the Motor Vehicle Registry Office is closed on the weekend, there will be additional parking along the public road there. Please heed the directives of the school’s security and parking attendants. 6. Gate Fee: 50 baht donation for adults. Children are free. 7. All Stalls will include: one 4 M x 4 M area – one rectangular table, two chairs. Please do not take chairs and tables from other stalls. Also, one electrical outlet is provided, but only for 3 amps. This is not sufficient for running electrical appliances. Please pay special attention to hot cooking utensil safety. Banners at your stall should be no larger than 0.75 X 3.50 M.
8. If you have not paid your 1500 baht for your stall yet, please do so as soon as possible. 9. Only donated beer will be sold at the fair, so, please do not sell beer at your stalls! 10. Children Coupons: These are for project children, so they can play games and activities for free; coupons are NOT redeemable for cash. 1. Please remember that there is NO smoking on the school grounds. 2. Please NO pets on school grounds. 3. There is no running water at the stalls. 4. There is no ice or change available at the fair. 5. Please bring trash bags to keep your stall tidy and clear all items at the end of the event. 6. Please secure valuables at all times. If there are any questions please contact our fair site coordinator at 089-930-3558. The second event is our Gala Party Night, which is on Saturday, September 21st at the Amari Orchid Pattaya. This sit-down buffet dinner affair, which includes complementary wine/beer, entertainment, auctions and grand raffle drawings, has been a hit with our supporters. Tables are filling fast, so if you would like to book a place the cost is 2200 baht and our contact is: [email protected] .info.